Sodium Tallowate, Sodium Cocoate, Sodium Palm Kernelate, Water, Glycerin, Fragrance, TiO2, Mineral Oil, Polyethylene Glycol, Shea Butter, Castor Oil, Vitamin E, Vitamin A, Pentasodium Penetate, Sea Whip Extract. After years of successful results with Panoxyl bar 10%, it is now back to square one. Thanks to the "geniuses" at Stiefel, I've had to find an alternative to Panoxyl bar 10% and I thought Coral Actives Acne bar was it. This bar has too many ingredients that try to counter the drying affects of benzoyl peroxide with horrible results. My problem areas have flared up with a vengeance. I do not recommend this product at all. Can't wait for Panozyl Bar 10% to return to store shelves. After about a month using Coral Actives acne cleansing car, I'd say it is a good alternative to Panoxyl 10%, but not as effective. I will definitely switch back to Panoxyl once it returns to the market. Great panoxyl bar alternative Same as Panoxyl bar, but if it helps with acne then you gotta live with it. Was on my last bar of panoxyl 10% and it doesn't look like they will be returning to store shelves any time soon. 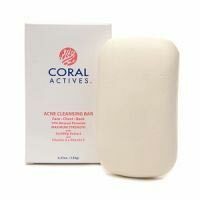 Luckily, I found Coral Actives 10% bar. Same active ingredient (10% benzoyl peroxide). Works great.